Harry Reid at the National Clean Energy Summit in 2010. He has helped develop both Nevada’s and the nation’s renewable energy industry. Roger Scholl first met Harry Reid in 1983, the year Reid began his first term in Congress, representing a Las Vegas House district. Scholl, now the state chair of Friends of Nevada Wilderness, had worked for years to develop a sweeping 2.2-million-acre wilderness proposal for U.S. Forest Service lands in Nevada. Reid agreed to support a wilderness bill, with one stipulation: He wouldn’t protect a place he hadn’t seen himself. So in July 1985, Scholl took Reid and a group of politicians and government officials on a weeklong tour of the state. Traveling in a twin-engine helicopter, they dropped into staggering landscapes, including high-country lakes set amid towering peaks — the lush yet rugged corners of Nevada that few even knew existed. “It had a kind of religious conversion effect on a lot of people,” Scholl recalls. In 1989, Reid, then a U.S. senator, sponsored the Nevada Wilderness Protection Act, which protected 13 new wilderness areas and 733,400 acres. It was the first new wilderness designated in Nevada since the Wilderness Act passed in 1964, and it happened because Reid struck a shrewd compromise. The bill made concessions to potential developers and Republicans by “releasing” all other roadless Forest Service lands in Nevada — roughly 3 million acres — from wilderness consideration for a number of years. Reid traces his own environmental awareness to his youthful visits to Piute Springs, a Mojave Desert oasis a day’s bumpy drive from the remote mining town of Searchlight, where he grew up. When he returned home as an adult to show his wife his beloved refuge, the springs and a nearby old military fort had been trashed. “Since that day, I have done everything I can to preserve the environment,” Reid says, including helping to create the Mojave Natural Preserve, which protected the springs. A Mormon convert and one-time boxer, Reid paired a commitment to Nevada and the environment with a pragmatic but stubborn tenacity. Representing a state with minimal, albeit growing, political influence, Reid became the Democrats’ ranking Senate leader. He jockeyed Obamacare and the 2009 stimulus package through a polarized Congress. He fended off plans to locate a high-level nuclear waste dump in Nevada, and helped develop his state’s renewable energy industry. And while his environmental record isn’t spotless, his accomplishments serve as proof of his ability to flat-out get things done in Washington. “He’s never been a politician who tried to play it safe,” says Scholl. No issue better demonstrates Reid’s political muscle than Yucca Mountain, the proposed nuclear-waste repository in Nevada’s southwestern corner. When Reid ran for the Senate in 1986, he campaigned on fighting the site. He won the race, but the next year Congress passed what Nevadans call the “Screw Nevada” bill, which removed other sites from consideration, making Yucca Mountain the de facto choice. Reid took the decision personally, fiercely denouncing other politicians who wanted to use Nevada as the country’s nuclear waste dump. Reid complained that Yucca Mountain wasn’t selected because scientists considered it the best site, but because the Nevada delegation lacked the power to stop it in Congress. 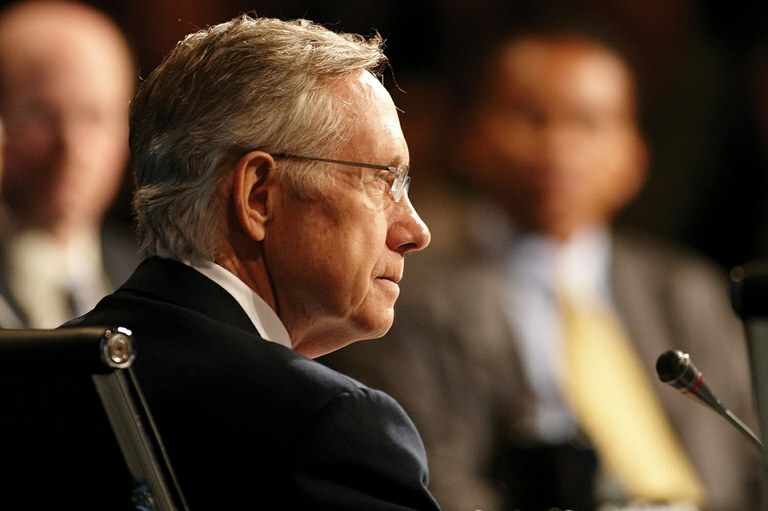 “When they … jammed it down Nevada’s throat, I opposed it for basic unfairness,” Reid says. For the next 15 years, Reid blocked studies and funds for anything related to Yucca, while raising concerns about the safety of transporting nuclear waste and the risks of earthquakes and groundwater contamination at the site. After President George W. Bush’s Energy Department recommended moving forward with plans to store waste there in 2002, Reid wielded his power as Senate minority leader. He held up several Bush appointments to force a deal that landed his own energy advisor a spot on the Nuclear Regulatory Commission, which is responsible for licensing nuclear-storage facilities. “But for Harry Reid, we’d have nuclear waste at Yucca Mountain,” says Debbie Sease, the Sierra Club’s lobbying director in Washington. Sease recalls a press conference outside the Capitol, where lawmakers and environmentalists gathered to oppose the latest study or funding plans for Yucca Mountain. Reid took the podium, flanked by a semicircle of supporters, including Sease. 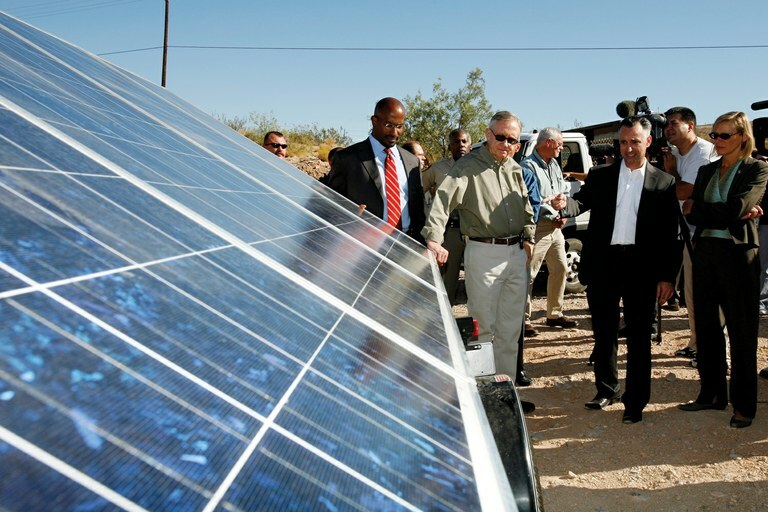 Harry Reid checks out a solar panel at the Rob’s Ridge Solar Project in Las Vegas, Nevada, during a National Clean Energy Jobs Tour in 2009. In the early ’90s, he brokered the Truckee River Accord to resolve a century-long water war between California and Nevada cities, Indian tribes and irrigators who were collectively overusing the river, which runs from Lake Tahoe into Pyramid Lake. The agreement allocated tens of millions of federal dollars to improve the Truckee’s water quality and to better store and manage flows, while also enabling the Pyramid Lake Paiute Tribe to restore the lake’s fisheries. Similarly, he sponsored a run of county-level wilderness bills that incensed rural Nevadans, even though the bills included concessions to transfer or sell off other federal lands around Las Vegas and in rural Nevada. Eastern Nevadans and Republicans also blasted his support for closing local coal-fired power plants and developing more solar energy. On the other hand, Reid’s opposition to reforming the archaic 1872 General Mining Law, which lacks environmental protections and prevents taxpayers from earning royalties from hardrock mines on federal lands, ticked off environmentalists. And his support for a proposed 300-mile pipeline that would move groundwater from remote valleys surrounding Great Basin National Park to Las Vegas enraged both environmentalists and rural conservatives, who see it as a destructive and pricey water grab. Reid, however, argues that the project includes protections to limit groundwater losses and that irrigation reductions would mostly affect alfalfa farming in northern Nevada. After winning re-election in 1998 by just over 400 votes, Reid developed a formidable state network to buoy himself and other Democrats. Nevada Republicans have since been “completely overwhelmed” by what pundits dubbed “the Reid machine,” says Chuck Muth, the former executive director of the Nevada Republican Party. Last fall, in addition to winning the state for Hillary Clinton, the network helped elect Reid’s handpicked successor — Attorney General Catherine Cortez Masto — to the Senate. Another Reid acolyte, Ruben Kihuen, grabbed a U.S. House seat from the GOP. Reid worked to consolidate power for Democrats in the Senate, too. In 2001, he was instrumental in convincing Vermont’s liberal Republican Sen. Jim Jeffords to become an Independent, thereby flipping control of the Senate to the Democrats. Four years later, Reid became minority leader, and remained the most powerful Senate Democrat until his retirement. That made him the quarterback for fighting Republican actions during the Bush years and fulfilling President Obama’s agenda. Perhaps most notoriously, he triggered the so-called “nuclear option” in the Senate in 2013. Frustrated by Republican obstruction during the Obama years, Reid eliminated most filibusters on presidential nominees and cleared the way for simple majority approvals. “Any program they didn’t like, they just wouldn’t let us do it,” Reid says, by preventing Obama and Democrats from staffing departments, boards and judgeships. With Reid’s retirement, Nevada’s political future becomes uncertain. Many expect to see Yucca Mountain rise from the grave, along with a steep falloff in federal funding for renewable development on Nevada public lands. Others wonder if the “Reid machine” can keep humming without its namesake.